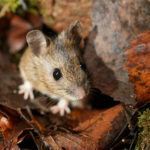 Home / Modern Pest Blog / What Pests Are Lurking in the Bottom of Your Leaf Pile? What Pests Are Lurking in the Bottom of Your Leaf Pile? For many New Englanders, the crisp fall air, beautiful foliage, and the smell of autumn leaves collecting on the ground and crunching under our feet, equates to some of the many reasons we love Fall. 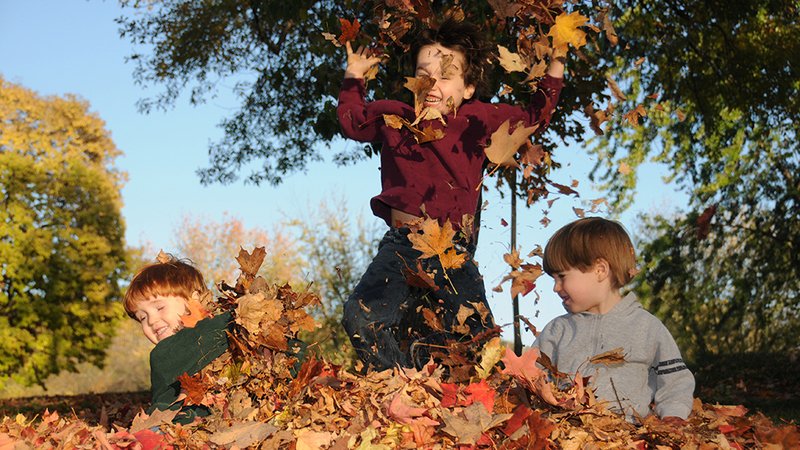 For children, on the other hand, it’s the irresistible lure of jumping and playing in a huge pile of colorful leaves. But don’t worry, we aren’t here to tell you that those leaf piles are hazardous or concerning to play in because of pests. While it’s true, there might be a hidden bug or two that got sucked up into the pile while you were raking. It is also likely they have been swept away during the act as well. However, if your pile of leaves ends up sticking around the yard for the long term, then you might be creating a pesky situation. Got Creepy Crawlies? Modern has the solution – GUARANTEED! Learn more about our HomeCare Green year-round protection program that covers 60 common pests! You will hear us throw that term around a lot around here at Modern. Conducive Conditions. What does that mean anyway? Well, we are always looking and inspecting for conditions around your home that promote pest activity. Things like a forgotten leaf pile. We do that because it is our philosophy to treat pest issues at the source. By ignoring that pile of leaves hanging out in the yard, it becomes a pest magnet over time. Let’s explore which pests will most likely decide to make that pile of leaves their home. Ants – A leaf pile is very attractive to ants for lots of reasons. It provides warmth and insulation from the long cold winters for one. It is also filled with organic matter that makes an excellent food source for ants and other insects. Ants and other insects also make great food sources for other critters. You can see where we are going with this. By attracting ants and other critters to your yard, it is much easier for them to also make the short leap into your home. Earwigs – You may or may not know what these oddly named and unusual looking insects are by name. Earwigs are ¼- 1-inch insects that are dark brown, with long, flat bodies and a set of pinchers at the end of their body. They, in particular, prefer moist, shady areas and will feed on plant material and debris. Thus, making forgotten leaf piles ideal habit and food source, all wrapped up in one. The good news is they are not considered harmful. However, they may then decide to also seek shelter in your home for the winter, where they are most definitely not wanted — ick! Rodents – Mice and rats also find leaf piles to be attractive areas to find food and shelter. That is because they like dark, quiet areas, with access to lots of nesting materials. As chronic nibblers, they love gnawing on twigs. As omnivores, their diet consists of many things, but seeds, insects, and vegetation or high up on the list. With that forgotten pile of leaves being so close to the house and their ability to squeeze into holes the size of a dime… once they sneak into your home, they CAN become a serious health risk for you and your family. Rodents are known to carry over 35 diseases! Snakes – As with the creatures mentioned above, snakes will also be attracted to long-forgotten leaf piles, for many of the very same reasons. Snakes often eat rodents and will also need a cozy, quiet location to hunker down. Like with all the other creatures mentioned above, as long as they decide to stay outside of our home, we are usually not bothered by them at all. While, it may be easy to let cleaning up those forgotten leaf piles, stay at the bottom of our priority lists. Our neighborhood pests will sure appreciate the refuge you created for them. They may even start eyeing your home as another great location to set up shop. So break out the rakes, wheelbarrows, and industrial-sized garbage bags and get those leaf piles cleaned up! You can prevent unwanted pests from sneaking in this fall in the first place! Modern Pest Services not only treats your home for pests but works to prevent pest issues. We do this by performing thorough inspections and making recommendations to eliminate those “conducive conditions”. We then perform carefully targeted applications, using the least amount of material, so you can rest easy, knowing that your home or business is pest free. 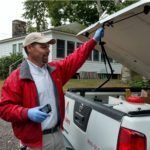 Every season brings a new threat, which is why our HomeCare Green program has been designed to target specific pests based on the time of year. HomeCare Green offers year-round protection against 60 different household pests – guaranteed! So, contact Modern today and request a free quote!